An amortization schedule is a useful tool when you opt for a loan. These Schedule Templates arrive with an elaborate table comprising of the details of every payment that you are supposed to pay at each repayment installment- starting from the beginning till the end of your whole repayment term. One of the best bits about these schedules is that here you will get a clear visual of the principal & interest breakup for each installment. 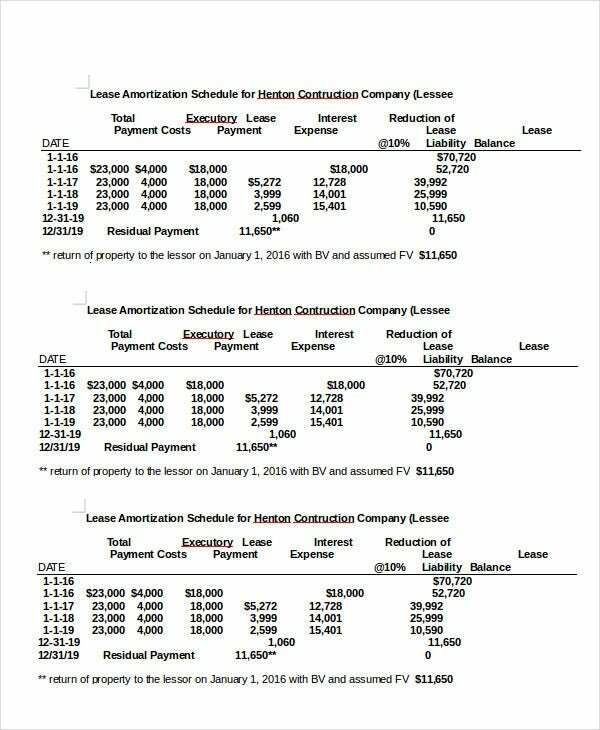 This Excel Amortization Schedule template comes with loan repayment schedule tables for two types of home loans. On top of it, you have a box to host the basic details of the loan. You have a neat and smart loan payment schedule template here which includes all the basic elements of an amortization schedule such as the payment date, scheduled payment, beginning balance, etc. 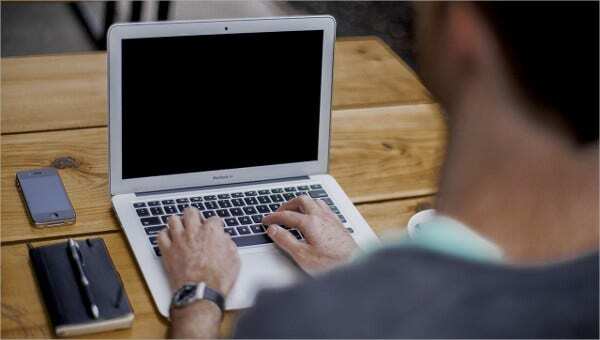 Moreover, there are two tables for loan summary and basic loan details. > What is the purpose of an Amortization Schedule? A loan repayment period can go on for several years where it becomes tedious to keep account of all the installments and their respective payment time. This is where an amortization schedule comes in. The main purpose of amortization schedule is to present you with a framed table carrying elaborate details of every periodic payment in regards to the amortizing loan. It will offer you a precise idea about the interest and principal amount that you would need to pay in each payment period. Another big purpose of the amortization schedule is to make sure that you have a complete log of your payments at each interval. You can also see Travel Schedule Templates. This amortization schedule begins with a table with tips on calculating the loan payment and below that you have an amortization schedule for the first six months of the payment. > Who needs an Amortization Schedule? An amortization schedule is a handy tool when you have borrowed a loan, say a mortgage or a car loan. 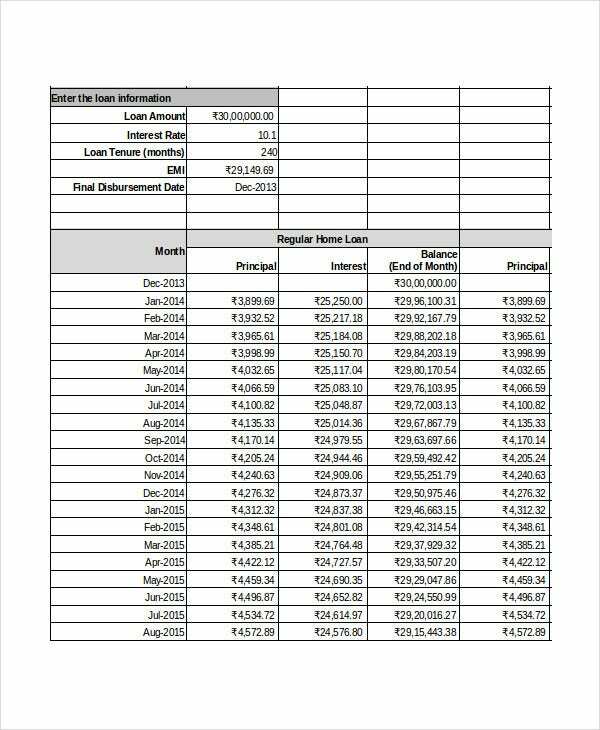 For a borrower, such a schedule offers a comprehensive picture of the principal and interest to be paid at each repayment period- till the last repayment term. On the other hand, these schedules would be helpful for lenders as well, be it individual lenders or financial institutions like banks. Also, amortization schedule would be required by companies taking to lease agreement considered as the capital lease. Besides, those going for bond amortization would benefit greatly from a bond and interest amortization schedule. You can also see Loan Payment Schedule Templates. 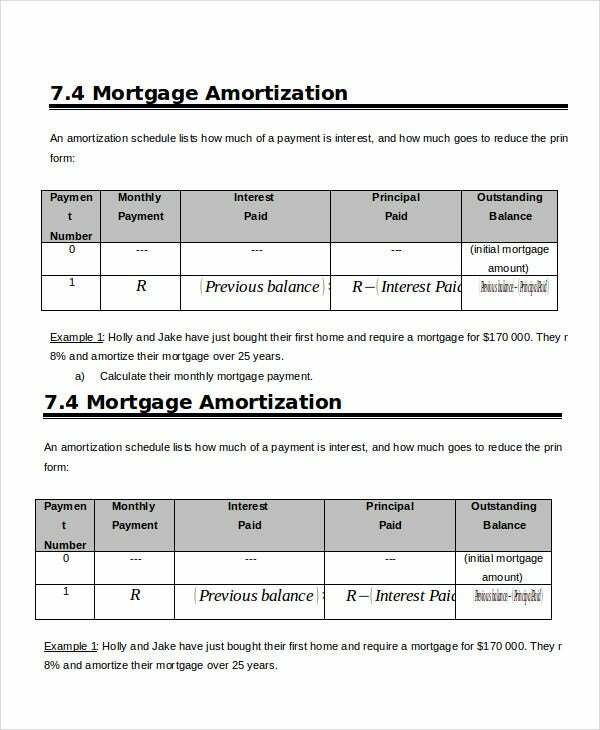 This amortization schedule template starts with a general bond and interest amortization schedule with a customizable example. 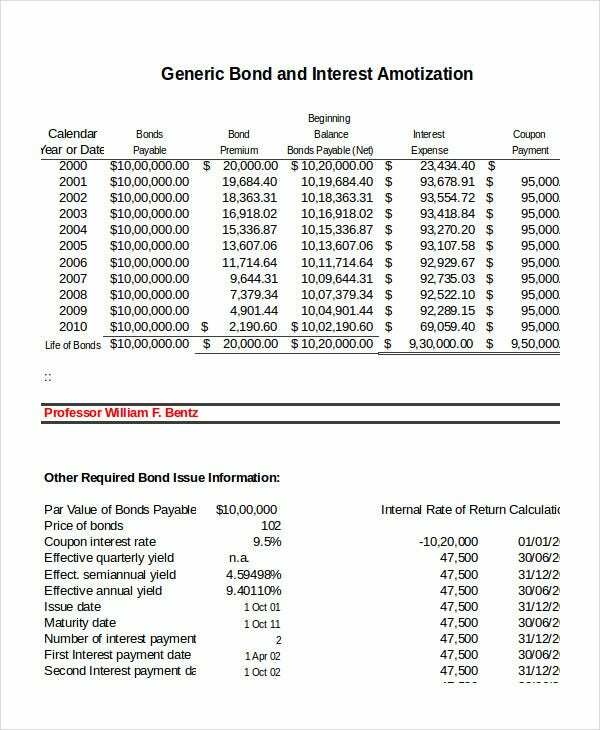 Besides, the document also houses additional bond issue data including internal rate of return calculation. This lease amortization schedule comes with a document on lease agreement considered as the capital lease. It includes terms of the agreement, capitalization criteria, calculation of current value of minimum lease payments, etc. > What does an Amortization Schedule Cover? An amortization schedule primarily covers the list of your periodic payments when you have borrowed a loan. It comes with an elaborate table with sections on each key elements related to your payment installments- such as payment number, date, beginning balance, scheduled payment, total payment, principal, interest, ending balance and cumulative interest. Some tables also contain a section on Extra payment. Added to this primary table, some of these schedules even come up with a separate table on loan summary so that you can have a basic idea of the entire picture at a glance. A loan repayment calculator is also available with a good lot of schedules. You can also see Event Schedule Templates. 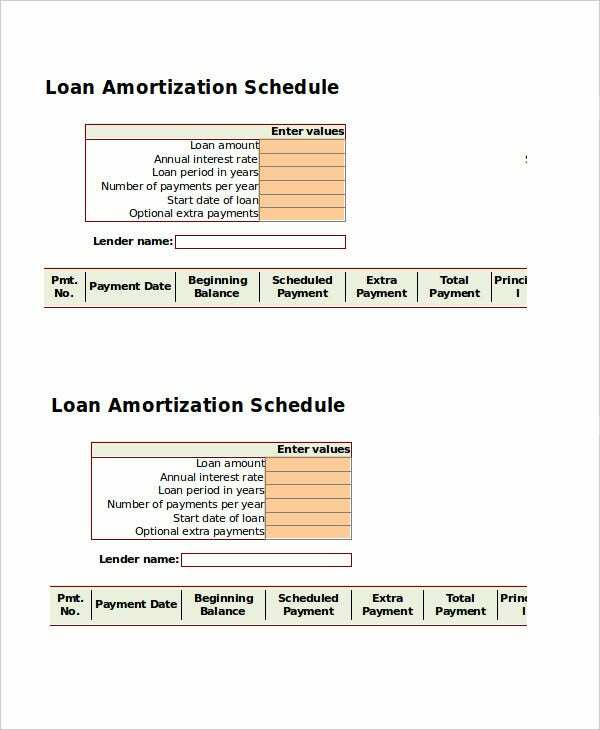 If you need suggestions on how to create amortization schedule, the loan payment schedule templates mentioned above would be of amazing help for you. All of them come with readymade amortization schedule tables and you would simply have to customize them with your loan data. Some of these templates also contain a loan repayment calculator for your convenience.